Pierate - Pie Reviews: Guest Pie Review: "Smuggle me Tanglefoots!" 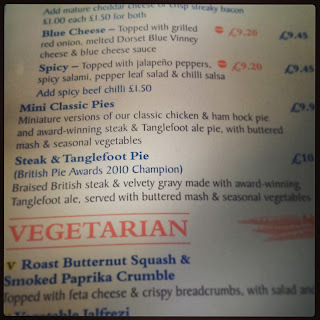 Guest Pie Review: "Smuggle me Tanglefoots!" Last weekend my girlfriend and I took a trip down to Weymouth in Dorset to catch up with family and hang out with friends. Fortunately the sun also decided that it was now a good time to don their panama hat and start smiling! On Sunday we took Nan out for Sunday lunch to a new place for us, the Smugglers Tavern in Osmington which dates back to the 13th century and oozes bags of character. The Tavern is owned by Hall and Woodhouse and therefore benefits from a wide selection of Badger ales. I expected the menu to contain the usual pub lunch items and as not driving was looking mroe forward to the ales than the food. We reserved a table and were directed to a comfortable cranny, each taking the menu presented to us. 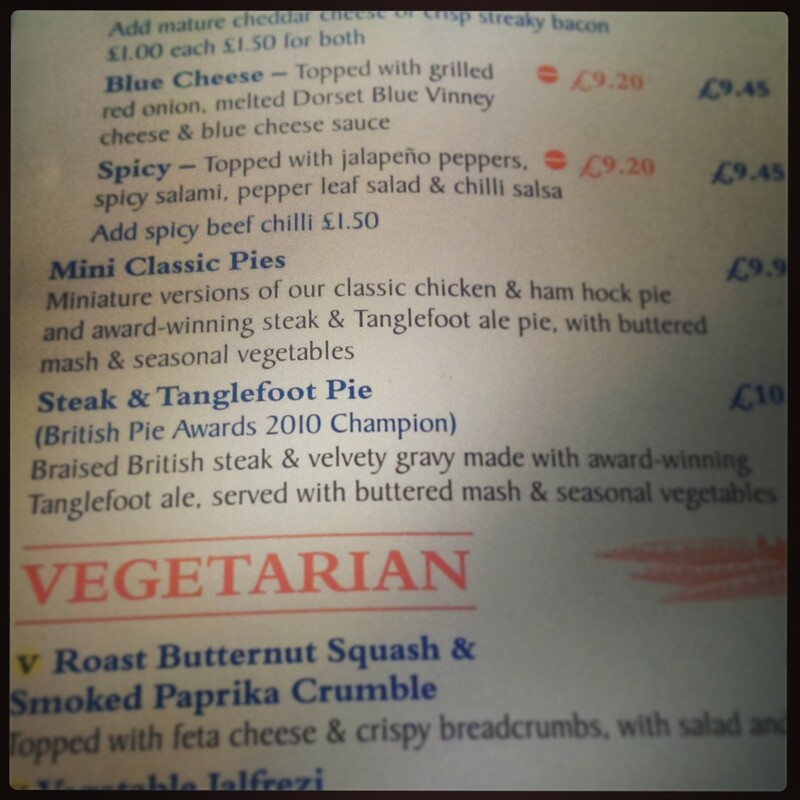 Having spent the first 23 years of my time on Earth in Wigan the first thing that jumped out to me was the pie, or to be more precise the "Steak & Tanglefoot Pie" with the interesting comment of "British Pie Awards 2010 Champion". I'd heard of Tanglefoot before, but admit I had to double check whether this was an ale or some strange posh green vegetable. This was going to be a very simple choice! 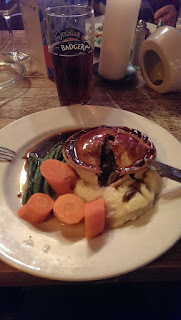 We ordered and chatted away, and I hoped beyond hope that this pie would live up to it's accolade. Our meals arrived and the waiter asked "who is having the pie"; as if that needed to be asked! I glared at my plate with tunnel vision. 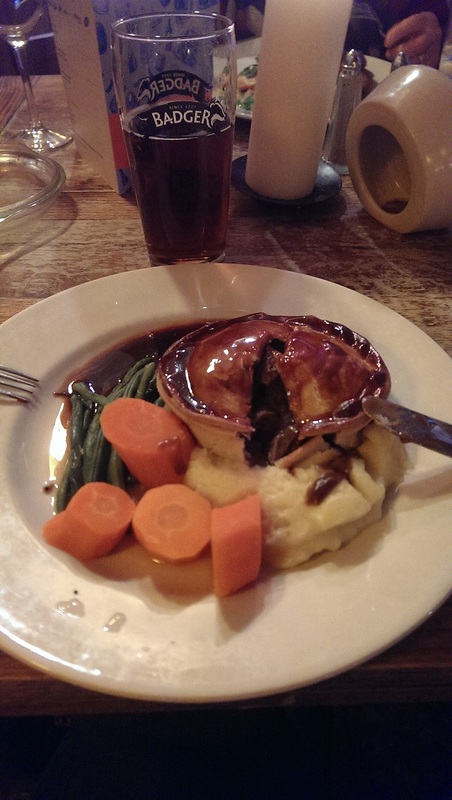 The dish looked exactly as described, a gentle steam emitting from the pie to whaft the amazing smells of both the pie and butter mash that it sat gently upon. The emulsion gravy shone like velvet. Just like the last jelly baby in the packet, deciding where to start took me a few moments. From the side, in the middle, or just pick it up one-handed style? I decided to cut pac-man style, from middle to edge with a slight push to open the inside. The filling was simple yet effective, chunks of tender braised steak in a wonderful ale sauce. No fuss, and none needed. Capacity just perfect. Crust moist yet not too wet. In typical British fashion I stole bread from my better half's lamb stew and her leftover chips to mop the plate clean. I've no idea what we spoke about. For 7 minutes of my life it was just me and my pie. All in all a wonderful pie, perfect trimmings and all wrapped up in a brilliant pub and tranquil setting. Rating: 6.5/7 - at £10.65 it's just that wrong side of £10. John Lowe is Founding Partner of Energetic Technology and originally from Wigan, the home of Pies and the family bakery. He now lives in London and every day misses his one true love, a "Meat and Prater" Pie. Iceland – the land of the frozen pie! Serving up a Classic Pork Pie?